Last time we created a mold by using a wax model and investment. But is it really a mold that we can pour molten metal into yet? Nope! We now need – Heat, Heat, and More Heat! Right now the investment is still soft and it still contains waaay too much water to be anywhere near molten metal. Most of the wax has been melted out by the dewaxer, but the investment now needs to be hardened, the remaining wax needs to be burned away, and any remaining moisture in the investment needs to be driven off. The way this is accomplished is by placing the flasks into a burnout oven and cooking them for hours. Here is a picture of my burnout oven. And yes, 947 is the temperature in the oven. This is actually the low end of the temperature cycle, the temperature at which the flasks are held, at the end of the burn-out cycle while they are waiting to be cast. The high temperature portion of the cycle varies, depending on exactly the type of investment that is used, but it is often around 1300 degrees Fahrenheit. The burnout cycle starts slowly, at about 200 degrees and gradually increases. By the time it is at 700 degrees we open all of the windows and doors in the Studio to let the fumes out. 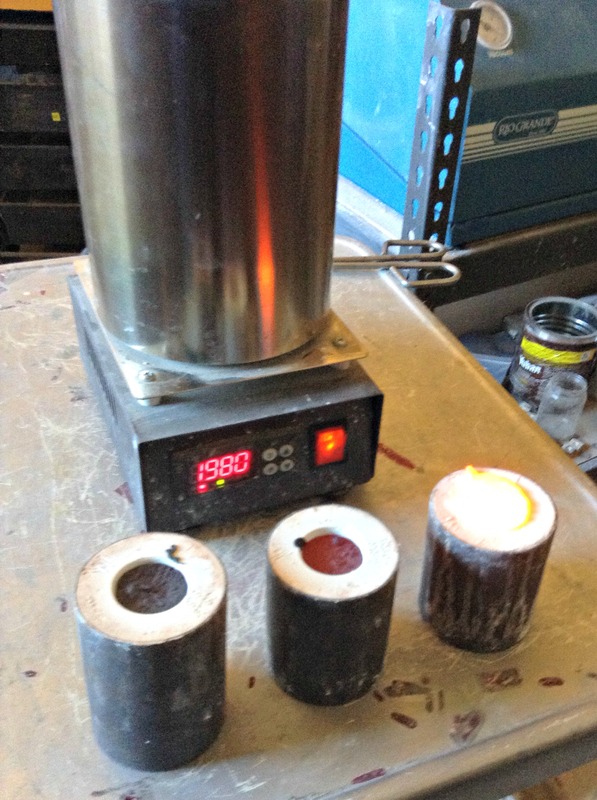 Burning casting wax is a truly nasty smell, and not good for you. 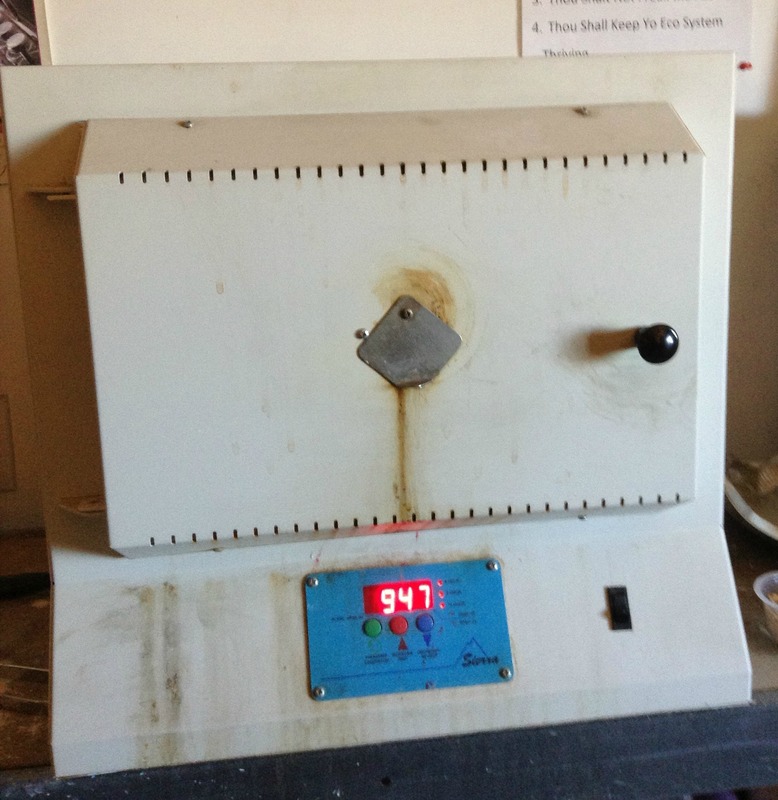 By the time the cycle is finished and we are at the holding temperature, about eight hours later, the smell is gone and there is no more wax residue left in the flasks. They are now officially molds! Once the end of the casting cycle is coming to an end it is time to start melting the metal. I have two electric melting furnaces, a small one that uses a removal crucible, and a bigger one, which is called a “tilt and pour” This just means that you pick up the entire furnace and pour the molten metal directly from the furnace into the flasks. 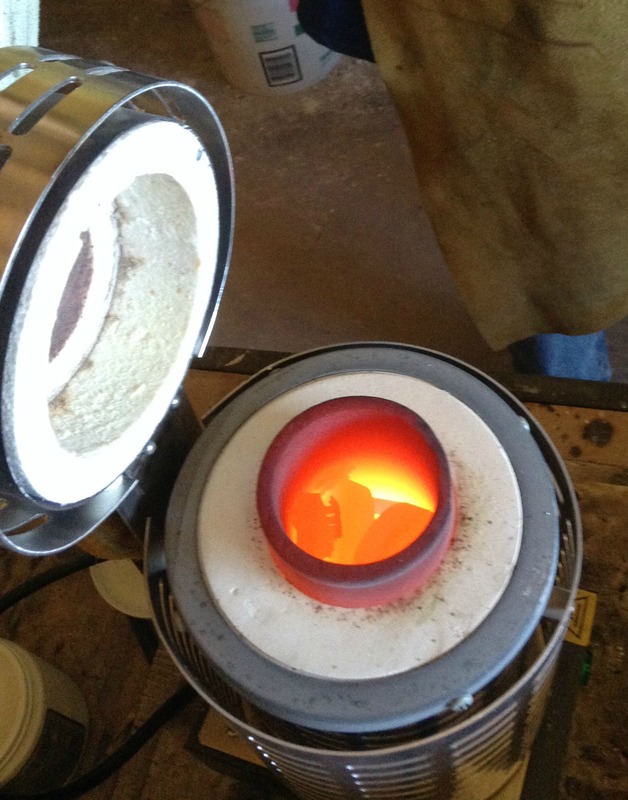 In either case I have to preheat the graphite crucibles in the furnaces, add the new casting grain and the old metal that I am re-melting, and wait. If you peek into the furnace while it is heating, this is what 1980 degrees Fahrenheit looks like. Once the metal has melted completely, I start bringing the flasks out of the burn-out oven one at a time. The flask is placed on the silicone pad on the vacuum machine, the vacuum is turned on, and the molten metal is poured into the flask. And this is what it looks like. The vacuum machine is actually pulling air out of the bottom of the flask, which helps produce better castings. The flasks are removed from the vacuum machine and set aside to cool. Here is a picture of three flasks cooling on a metal cart. They are sitting next to my small furnace. This is a great picture because it really shows how you can see what temperature the metal is by its color. The right hand flask is yellow because it is the hottest. The almost black metal on the left is ready for the next step in the process. 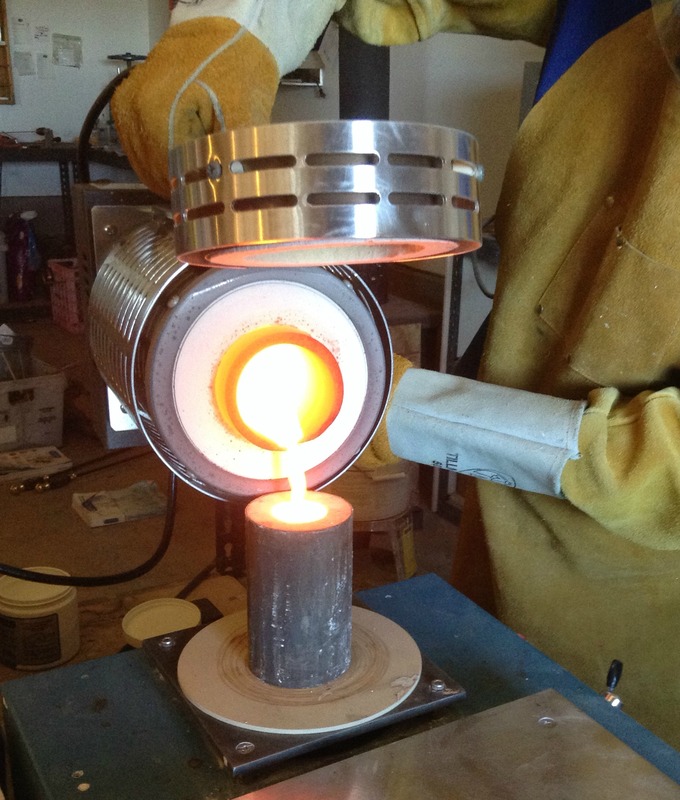 Next Time – What Happens Now That We Have Poured the Metal? This entry was posted in Metal Casting, Metal Working and tagged casting bronze, casting metal, casting silver, Lost Wax Casting, Metal casting by Eirny. Bookmark the permalink.